In order for a faculty classification to be available in Faculty Classification Reports, the option Show as filter in reports must be set to Yes when creating the faculty classification. Note that this option only applies to those faculty classifications with a display type of Dropdown Select Box or Multiple-Item Select Box. 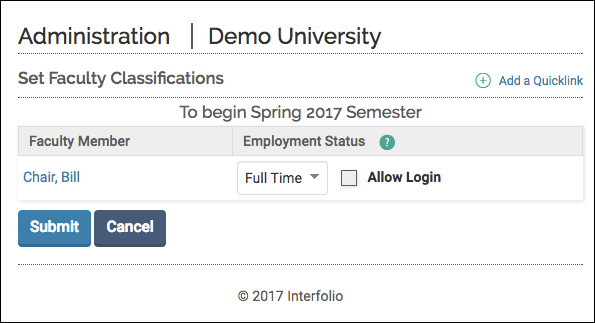 On the Admin section of the navigation menu, click Reports > Faculty Classifications (in the Administrative Reports section). Select the Unit for which the report is to be run. Click the Change link to change the unit. Select the faculty classification from the Columns drop-down. Select the Semester term and year. Leave Count Only as the Display Mode. Optional: To filter the report by faculty, click the Select Faculty link and specify the faculty to select. Click the Build Report button. The report displays. Each number is a hyperlink. Click a hyperlink to drill down further on the data. The specific data for the faculty classification displays for each faculty member. To update the data for a specific faculty member, click the hyperlink (i.e. Non-Tenure Track). It is important to select the hyperlink that corresponds to the appropriate term in which the data should be updated. For example, selecting the link for Spring 2015 will update the data for Spring 2015 and every term forward. The screen refreshes to reflect the update to the faculty classification for the faculty member.